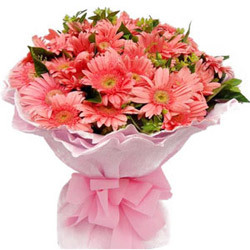 Nuzzle the heart of your partner with a soothing touch of your sentiments for her by gifting her this Cultivating Comeliness Gerberas Bouquet and magnify the romance connecting you both. This is a lively Bouquet of spruce 15 Pink Gerberas clustered together by a prim Pink Tissue exhibiting a Bow Pattern. Nuzzle the heart of your partner with a soothing touch of your sentiments for her by gifting her this Cultivating Comeliness Gerberas Bouquet and magnify the romance connecting you both. This is a lively Bouquet of spruce 20 Pink Gerberas clustered together by a prim Pink Tissue exhibiting a Bow Pattern.